Vince Lombardi, coach of the Green Bay Packers when they won Super Bowls I and II in 1967 and '68, said, "The greatest accomplishment is not in never falling, but in rising again after you fall." At the bridge table, it would be very easy to fall in this contract. What is the right line of play in six no-trump after West leads the club jack? 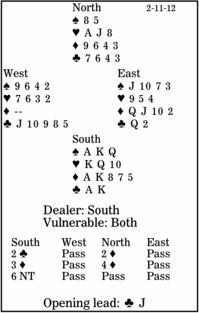 South has 10 top tricks: three spades, three hearts, two diamonds and two clubs. He needs two more diamond tricks -- four in total, not five. If diamonds are 2-2 or 3-1, everything works. If West has four diamonds, the contract is unmakable. But in case East has four, declarer should lead a low diamond from his hand at trick two. East wins and returns a club, but South takes that trick, overtakes his heart 10 with dummy's jack, and plays a diamond. East will probably split his honors (play one of them), but declarer wins, returns to dummy with a heart, and finesses East out of his third diamond honor. If you fell to defeat, pick up the cards and rise again in the next deal.